After our visit to Taipei 101 it was already quite late, so we quickly went downstairs into the shopping mall and to Din Tai Fung. I know it’s not the original place of the restaurant, but we decided to give it a try. Din Tai Fung is a big restaurant chain, it has branches in ten countries around the Pacific Rim (also in Hong Kong) and is famed for its xiao long bao soup-filled dumplings. I know that some people mistakenly believed that these delicious little dumplings are from Taiwan – but they are originally Shanghainese. Still, we decided to try them in Taipei, given that Din Tai Fung is famous for these little steamed treats. The Taipei 101 branch of Din Tai Fung is located inside that skyscraper’s basement-bound food hall. 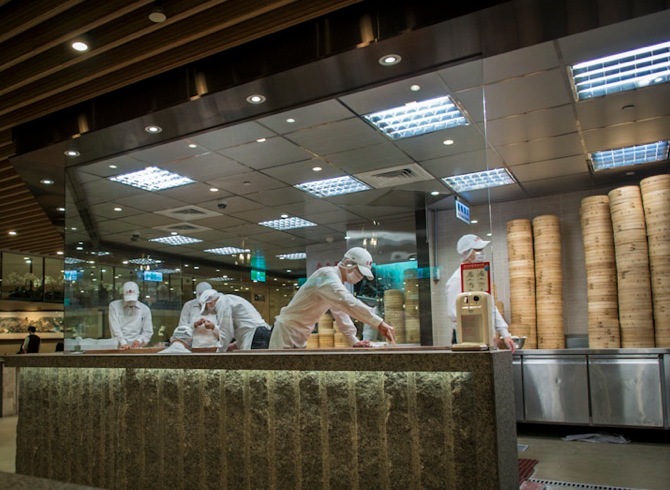 The dumpling-making process is visible through from the dining room, although it’s partitioned off by a glass wall. 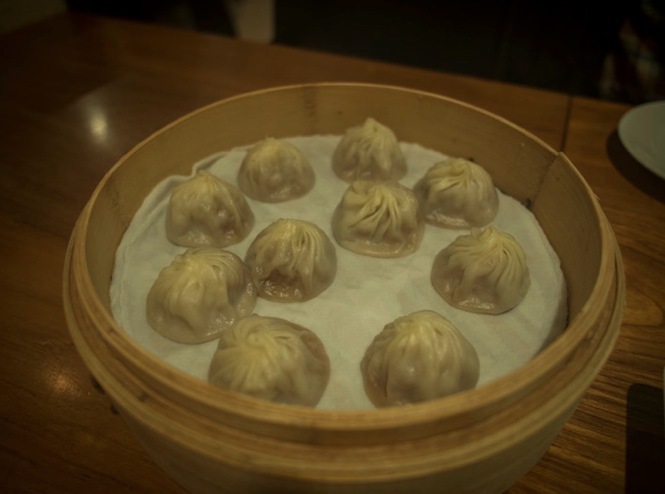 We ordered a few other dishes, including some soup and fried dumplings (which were all ok, but not special) and then had the main attraction, the xiao long bao. You get ten per basket. They are freshly made, with a very light skin and a very tasty soup and pork filling. They are burning hot, so you have to eat them very carefully. 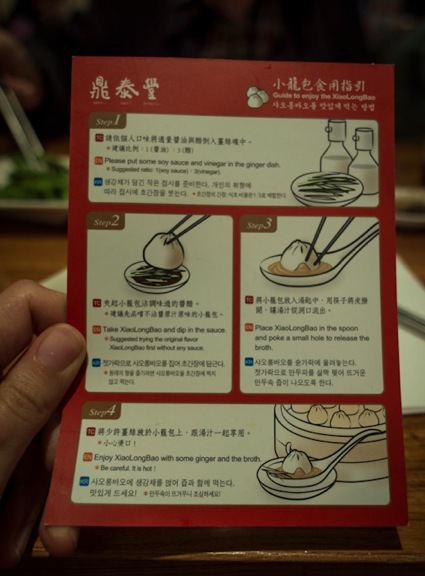 They even give you instructions on the best way to eat them, including guidance on how to mix the ginger with the soy in which you dip your dumpling before eating. Step 5 – Enjoy xiao long bao with some ginger and the broth. Careful, it can be hot! I really enjoyed the dumplings. The skin was thin but still with enough bite. The pork wasn’t too fine and still have texture. This was the best xiao long bao I’ve ever eaten! So it was worth to come to Din Tai Fung in Taipei 101 – even if you could ignore the other dishes and just order the dumplings.